August 3, 1861. The Civil War marked the first time balloons were used in the United States for reconnaissance. They had been used earlier for this purpose in Europe to a modest degree. Two principal aeronauts were Northerners: John LaMountain, of Troy, New York, and “Professor” Thaddeus Lowe, from New England. 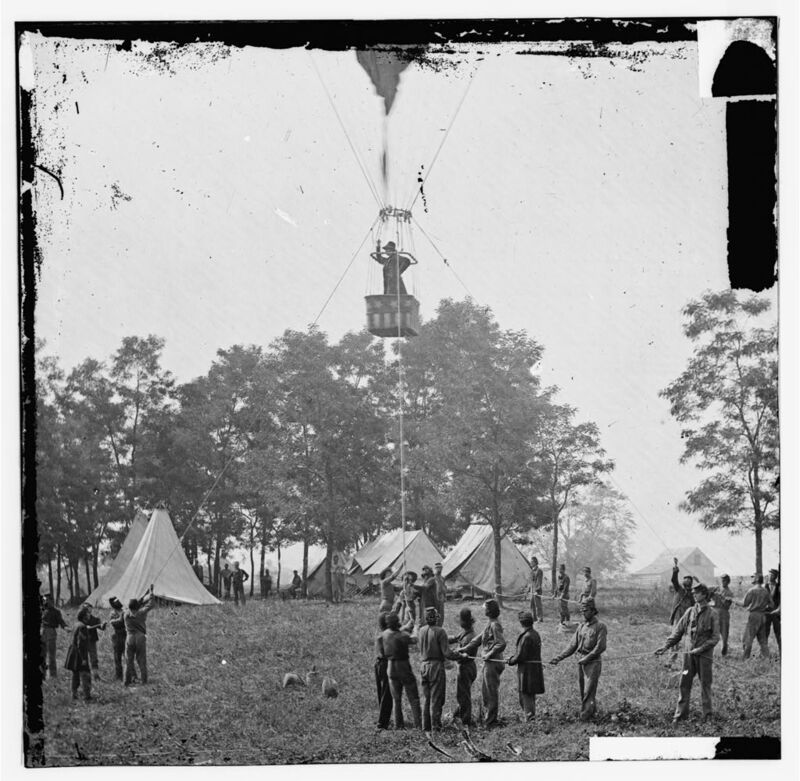 Thaddeus Lowe’s balloon, the Intrepid, being inflated at Fair Oaks, Virginia, May 1862. Library of Congress. Click on image to see larger. On August 3, 1861, LaMountain launched an observation balloon from a small ship in the James River, rising to an altitude of 2,000 feet. Later, in a nighttime launch, LaMountain estimated Confederate forces by the number of campfires he observed. Similarly, Lowe launched balloons from a rebuilt coal barge to which he had directed that a flight deck be built, making the USS George Washington Parke Custis the first aircraft carrier in history. In late September, Lowe ascended to more than 1,000 feet near Arlington, Virginia, across the Potomac River from Washington, and then telegraphed reports on Confederate troop movements in Falls Church, Virginia, more than three miles away. Using his intelligence reports, Union guns fired accurately on the Confederate forces — without being able to see the enemy, a first in military history. Word of these developments quickly reached Europe, and the Prussian army dispatched Count Ferdinand von Zeppelin to visit the United States to see what he could learn. Although balloon observations may have contributed modestly to a number of Union victories, observation balloons were not used on a large scale or to great results, in part because of shortage of funding, balloons’ limited mobility, and the substantial amount of time required to set them up and launch them. The Balloon Corps, a civilian organization established by Lincoln in the summer of 1861 and placed under the authority of the Bureau of Topographical Engineers, was disbanded in 1863. The Confederacy, too, had an interest in ballooning, but its efforts were more limited, at least in part because of lack of resources. Despite romantic tales, the few Confederate balloons that did see service were not made from silk dresses, although they were made of the same silk fabric used to make dresses. Fair Oaks, Va. Prof. Thaddeus S. Lowe observing the battle from his balloon Intrepid. Library of Congress. Click on image to see larger.